“I chased him for blocks, through parking lots and back streets." After Ryan Hunter and his fiancé Lisa lost their dog Travis in September, they decided they wanted to take some time before adopting another pet — until a dog who needed them more than anything came into their lives in the most unexpected way. 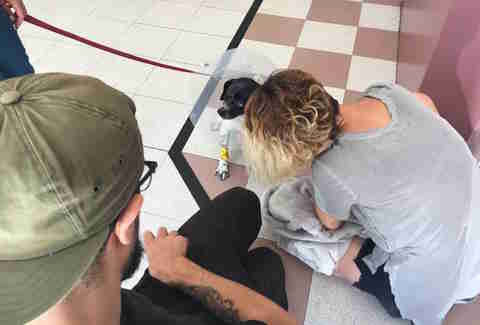 The couple was pulling into a parking lot in Los Angeles one morning when they saw a stray dog round a corner and head straight into oncoming traffic. Hunter immediately tried to help him, but there were just too many cars, and the dog was hit by a van on his right side. Still desperate to help, Hunter started to run over to the injured dog, later named Forrest, but the poor pup was terrified and began to run away as soon as he saw Hunter coming. 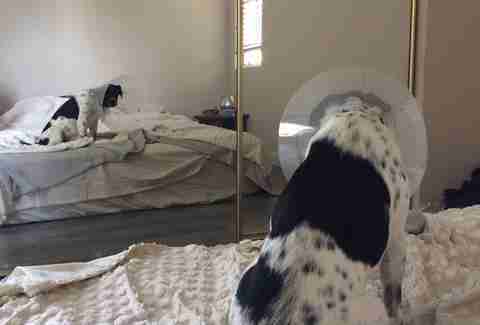 Hunter could see that Forrest was terribly injured, and knew he needed to get him to a vet as soon as possible. Still terrified, Forrest tried to bite Hunter as soon as he got close, and so Hunter sat next to Forrest for a while, slowly inching closer and starting to pet him, until finally the little dog seemed to trust him. He then took off his shirt, wrapped Forrest up in it, and rushed him off to get the help he so desperately needed. 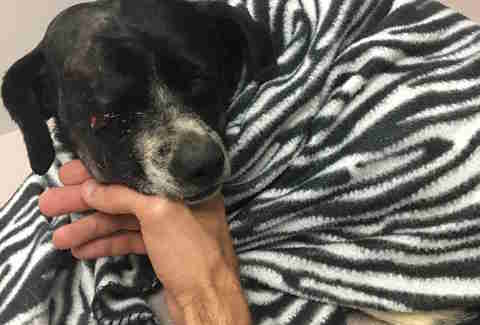 Forrest sustained some significant injuries from being hit by the van, including a severe eye injury and lots of cuts and bruises. He was already in bad shape to begin with, very dirty and covered in fleas, and the couple assumed that Forrest had been living on the streets for quite some time. The hospital manager informed the couple that a local shelter would be coming for Forrest later in the day, and would assess whether or not he was adoptable. 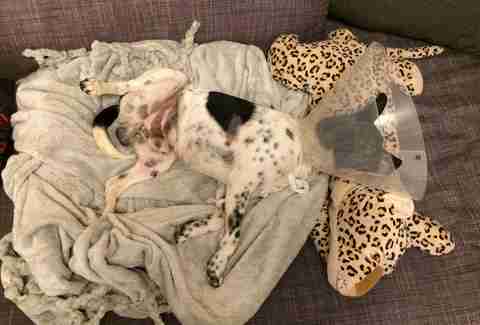 They asked what he thought would happen to Forrest — and he said usually, with dogs who were so significantly injured, they were put down before really being given a chance to recover. After hearing Forrest’s impending fate, and despite not having the funds to care for him, the couple immediately knew what they had to do. The couple knew that life with Forrest would be an uphill battle, but they decided they were more than willing to fight alongside him. Forrest went home with his new parents, and is slowly learning to trust them. He’s still terrified of everything around him, but he seems to sense that for now at least, he’s safe in his new home. He gets a little braver every day, and as his injuries continue to heal, his parents are excited to get to know his personality even more. Forrest still has a lot of medical issues to take care of, and his parents are doing everything they can to make sure he’s healthy and taken care of. Hunter is a member of a band called Envy On The Coast, and the band has decided to raffle off something special in order to help raise money for Forrest. It was a big decision to take on a dog like Forrest, with all the care and attention he’s going to need, but so far, every little moment with him has made that decision so, so worth it. 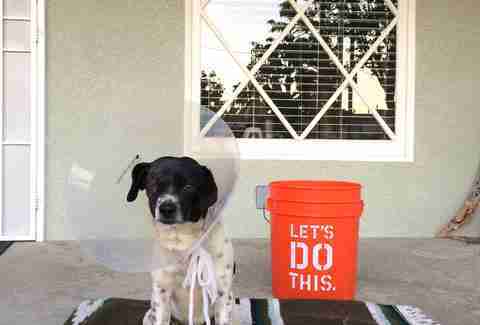 If you’d like to help Forrest and his new parents, you can make a donation to help cover his medical costs.